Post news Report RSS	0.4.8 Released! Alpha 0.4.8 released. Important features include client-side caching rewrite, player housing, ranged combat, music, females, animals, new items, action bar redesign, default campaign work and more. Players can actually craft and place their own houses in the game world! The ability to restrict access to your house will be coming soon. Players can also craft and place fence gates. The client-side caching mechanism has been rewritten to allow for the caching of more content. if you would like a little more info, check here. Music is now in. Currently there are two tracks available that play at short intervals. Several animals have also begun to populate the land. So far we have cats, chickens, and pigs. Chickens can be coaxed to lay eggs in chicken coops and can be harvested for their meat and feathers. Pigs have only their meat to give. Both chicken and pork can be roasted for eating. Eggs can also be thrown upon the ground for a small chance at hatching a new chicken. They'll be useful in other ways very soon. It is also now possible to begin the game with absolutely nothing in your inventory and make the tools you need to begin your adventure. Stone outcroppings have been added, and can be harvested for stone with your bare hands. Sticks can also be gathered from trees in the same manner. Fixed a bug that was incorrectly debiting an item from the player's inventory in the event that the item cannot be placed. Added a ladder item and carpentry recipe. Fixed the placement range on houses. Fixed character warping issue (LUGDUNON-282). Caused by oversight in instancing implementation whereby several categories of update events were being sent to all clients when they should only be sent to clients that have a character active in the instance where the event originated. Fixed a terrain issue with Owain and Peru's house. Lowered the opacity on the smaller UI buttons. Implemented a second layer of caching in the AssetManager for images. Added studded leather jerkin art asset and sprite definition. Added leather pothelm art asset and sprite definition. Added leather horned helm art asset and sprite definition. Added plate pothelm art asset and sprite definition. Added female human art assets and sprite definition. Took delivery of cat art assets from Meagan. Added raw and roast pork. Raw pork drops from pigs, obviously. Added recipe for roast pork. Added a bare hands item. This item functions as both a tool and a weapon. You can use your bare hands as a weak attack on NPCs. Using your bare hands on a full chicken coop will reward you with one or more eggs. Using your bare hands on a full yeast trap will allow you to collect the yeast. Using your bare hands on a tree will give several sticks. Using your bare hands on an outcropping of stone will reward you with several bits of raw stone. Given the above assertions, players can now start from nothing and craft themselves more advanced tools. Added an extra action bar slot for a mode's default action. This default action will be selected when no other action is and can't be altered. Added new button facade graphics. In addition to looking cleaner, mutable and immutable buttons are differentiated by their border color (gold for immutable). Took delivery of chicken and pig art assets from Meagan. They are almost too cute to kill. Almost. Added a yard chicken NPC. 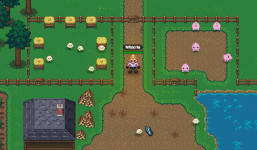 Added a farm pig NPC. Added chicken egg, raw chicken, roast chicken, and feather inventory items. Yard chickens drop feathers and meat when killed. Updated arrow recipe to use feathers for fletching. Added cooking recipe for roast chicken. Added net.lugdunon.command.core.play.ThrowEggCommand. Throwing an egg onto the ground will sometimes result in a chicken spawning. 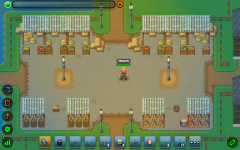 Added chicken coop placeable items, inventory item, and crafting recipe. Chickens will periodically lay eggs in an unoccupied coop. Players can then harvest them. Added support for conditions to be placed on a placeable state's evolution. Currently the only condition in place is NPC proximity. Fixed an issue preventing the elevation buttons in the terrain elevation editor from functioning under certain circumstances. Added the Bibracte tavern's assets to the main build. Consolidated the interior window placeable items. Added a wall sconce placeable item. Added a trestle table placeable item. Added 'Ategnatos the Bard' NPC. Fixed a bug with the FencingManifestationHandler ignoring grounding points. 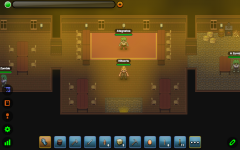 Added placeable items for a Manor House, Tavern, and Lamppost. Consolidated all of the boat placeable items into a single item. Fixed an issue that was preventing game masters from configuring certain placeable items. Added oodles (bins, sacks, and awnings) of placeable items for markets. Redesigned bridges to work with the new state configuration implementation. Flattened and consolidated existing bridges into a single item. Added support for weapons to require reagents. Added support for ranged combat. Added four grades of bows (stone, copper, bronze, and steel bound). This includes art assets, items and recipes. Bows have a longer cooldown than swords and will not fire if the player has no arrows. Added arrowheads, arrows, and linen thread (art assets, items and recipes). Added getWeaponRange(), getWeaponReagentItemType(), and getWeaponReagentItemCount() to the server-side Item class. Added the ability to configure item states (after placement) using the hammer tool. This allows for items (like chairs) to have their orientation configured by cycling through the placeable item's state progression list. Chair inventory item, crafting recipe, and art assets added. Chairs now have four states (face left,right,up,down) and can be configured after placement. Fixed current state of all placed chairs to "faceLeft". net.lugdunon.command.core.play.PlaceableStateChangeCommand can now be sent without a state. If a state is not supplied, the PlaceableItemInstance.evolve() method is called with the optional boolean set to true to force cycling. net.lugdunon.state.item.action.configure.TraverseThroughStatesAction configure action added to allow state cycling by game master. net.lugdunon.state.item.action.HammerActionHandler added to allow state cycling by player. Wrapped updateable and command calls in main game loop with try/catch blocks to hopefully catch the exception causing a server to become unresponsive. Completed more work on building out the town of Bibracte. Added north facing houses for each of the three small house styles. Added a sand deposit resource node, and art assets. Added a pile of sand inventory item, and art assets. Added a pane of glass inventory item, art assets, and crafting recipe. Added a wooden door inventory item, art assets, and crafting recipe. Added a window inventory item, art assets, and crafting recipe. Added a slate inventory item, art assets, and crafting recipe. Added a crafting recipe for a small red brick house. Fixed a few issues with the new resource caching code and playing music tracks. Fixed an issue with input lagging on iOS. Fixed an issue with placeable items retaining their highlight when a user mouses over a button. Added red brick art assets. Added gates, clay and stone resource nodes, clay bars, red bricks, gates crafting pattern, and red clay brick crafting pattern. Coal no longer drops raw stone. Raw stone must now be gathered from stone resource nodes. Added an input began boolean parameter to the manifestation handler on the client side. This is to allow the handlers to choose to ignore retriggered event calls. PlaceableStateChangeCommand can now be triggered from the client. Requires that the item definition have the allowsDirectStateChange property set to true. Range checks are conducted with the default value of 1 or the item definition's stateChangeRange property. Added the FencingGateManifestationHandler to allow users to open and close gates. Added an input retriggered event. This event will be fired when the mouse button or tap is held down. Firing interval is 51ms or roughly every 3 frames @ 60fps. Added art assets for fence gates, clay resource nodes, and clay bars. Instances can define music track listings and replay interval. game.playMusic() now takes in an optional boolean value. If this value is set to true, and music is currently playing, the new track will take precedence. If false, the original track will continue to play undisturbed. If an error occurs during initialization of the IndexedDB or WebSQL secondary stores, the default transient store will take over. Added pushQueuedInputEvent(), and processQueuedInputEvents() functions to net.lugdunon.states.ActionBarGameState. All queued input events are processed at the end of an ActionBarGameState.update() call. Added net.lugdunon.input.InputEvent base class and net.lugdunon.input.keybind.KeybindInputEvent, net.lugdunon.states.modes.GameModeInputEvent, and net.lugdunon.states.tiledGame.PointerInputEvent subclasses. Removed spaces from crayon font name. Fixed behavior of console toggling with input. Fixed mousewheel input for FF. Prevent storing of account-specific client-side variables for guest accounts. Implemented a localStorage + IndexedDB hybrid client-side cache. Assets that can be loaded asynchronously are stored in IndexedDB, while synchronously loaded assets stored in localStorage. The secondary store (IndexedDB) implemented as a pluggable module so that other solutions can be added later. Added game.getSoundVolume(), game.getMusicVolume(), game.getAmbientVolume() functions to allow for easy retrieval of volume levels. Have several music tracks that need to be added to the sound assets. Fixed (LUGDUNON-249). Character animations should now default back to the current orientation's idle pose. Added a volume setting panel. Players can set master, ambient, music, and sound volumes independent of each other. The smelting furnace now acts as a lightsource. Completed some work on both the quests and world for Phase II of the default campaign. Fixed (LUGDUNON-279). Items that are visible in edit mode only will not have their hitbox shown in play mode when /df hitBoxes is toggled. Fixed (LUGDUNON-275). The player spawn has been moved from the world.cfg file to the instance.json file so that each instance defines its player spawn point. Fixed (LUGDUNON-259). The advancement count in the player stats pane of the inventory dialog will now update to reflect and changes in the player's advancements. Added a listAudio() function to the AssetManager client-side class. Added a net.lugdunon.ui.sound.SoundSelectorDialog class for the selection of a sound asset. Added a net.lugdunon.ui.sound.SoundEmanatorConfigurationDialog class to allow game masters to configure sound emanators placeables. Added an isGuest flag to the client-side PlayerCharacter class. Guest players now have their name label text render in a light green to distinguish them from registered players. Fixed a bug in the label class calling a deprecated function when the label color is set. Fixed a bug that was causing input issues with the respawn rate input on the spawner configuration dialog. Fixed the sound emanator defaulting to a sound asset that is no longer present. It now defaults to the waterfall sample. Fixed beds a bit so that you can no longer walk under them. Still clips top of character's head though.